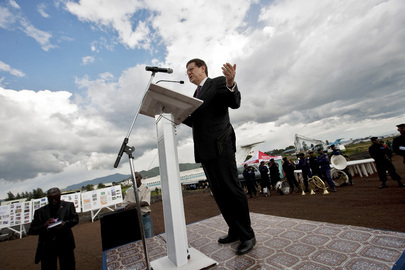 UNITED NATIONS, March 19 -- A day after the UN declined to say when the chief of its embattled peacekeeping mission in the Democratic Republic of Congo will be leaving MONUC, the Permanent Representative of the DRC Ileka Atoki told Inner City Press that "Alan Doss must go." 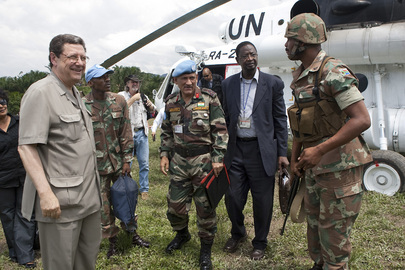 Inner City Press has asked Ambassador Atoki to confirm that his president Joseph Kabila has proposed to the UN that Doss be replaced by former top UN Peacekeeper Jean-Marie Guehenno, among others. "I can confirm that we have give the UN five names," Ambassador Atoki said. Asked about the nationalities, and whether any Britons were included, he said "three French and two American" names had been presented to the UN. "If the Secretary General extends Doss, even for months, there will be a problem," Ambassador Atoki said. He said that Doss was "condescending" and exemplified "corruption." Doss was exposed by Inner City Press for writing to the UN Development Program to show him "leeway" and give a job to his daughter. On March 18, UN Associate Spokesman Farhan Haq told Inner City Press that the investigation is "ongoing." 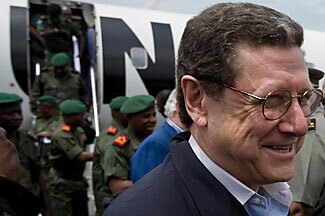 A nine month investigation of a six line e-mail, running out the clock until Doss leaves UN service -- as is now being demanded by the Congo. Watch this site. Ambassador Atoki said, of the UN Peacekeeping mission more generally, that the UN has to learn to speak more correctly to the Congo. Told of DPKO chief Alain Leroy's comment on March 18 that the UN must stay until critical tasks are completed, Ambassador Atoki emphasized that the UN can stay only as long as the DRC allows it to. 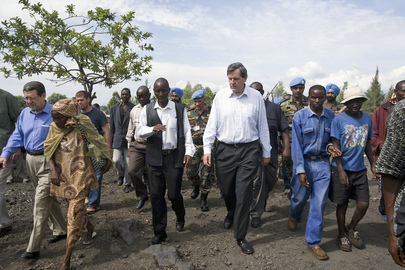 This is to inform you that SRSG Alan Doss's current contract expires at the end of June 2010. So is the absurd delay in the nepotism investigation only a way to avoid making findings before Doss leaves, and then to declare that the UN Office of Internal Oversight Services has not jurisdiction over or interest in former UN officials?